Genus Primelephas, (meaning the first elephant), belonging to the family of elephants and regarded as both the present elephants ancestor. Primelephas was living some 5 million years ago in dense forests in Africa. 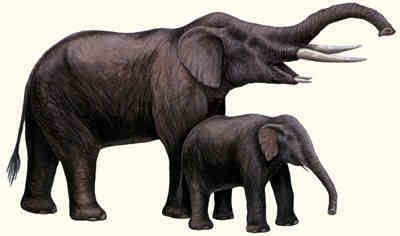 Primelephas gomphotheroides lived during middle Pliocene and split into three lineages, Loxodonta, Elephas, and Mammuthus. Systematic revision of Primelephas gomphotheroides (Mammalia: Elephantidae). Sanders, W.J., Mundinger, G.S., and Bloch, J. For Journal of Vertebrate Paleontology.